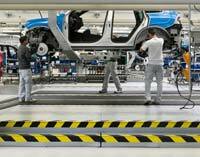 BMW has recently adopted Ubisense’s Tool Assistance System (TAS) for use in its assembly plant in Regensburg, Germany. The TAS is designed to identify and track in real time a vehicle as it is being assembled without the need to perform manual bar code scans. The system uses RFID to automatically identify the vehicle being assembled as well as detect the vehicle’s proximity to specific production equipment. Because different models are built in succession at BMW assembly plants, workers need to constantly load and reload the correct programs for their automatic tools via bar code scans or by entering information into a terminal, both of which are error prone procedures. When a worker loads the wrong information for a particular car a costly manufacturing defect is created. However, with TAS, if a worker approaches a tagged vehicle with an automatic tool, the appropriate program will be automatically loaded into the tool, eliminating the risk of human error. The Regensburg assembly plant uses nearly 120 tool systems to produce approximately 1,000 cars per day.